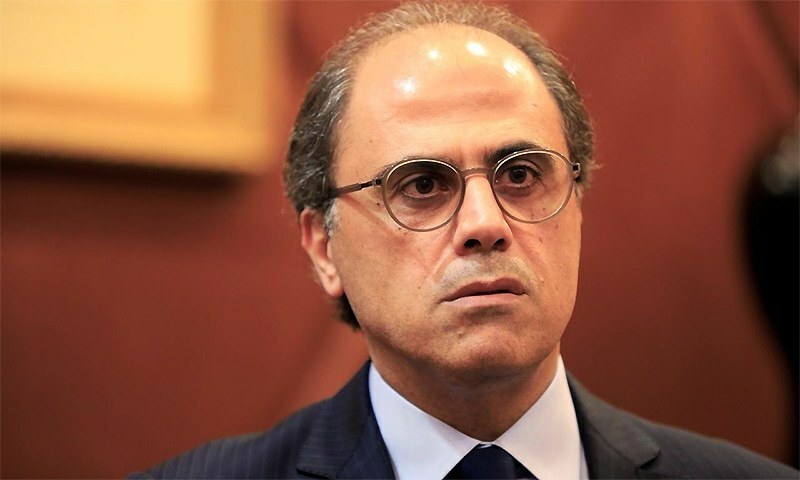 WASHINGTON: Pakistan’s economy is projected to slow down significantly and weigh on the region’s aggregate growth rate, says Jihad Azour, director of the Middle East and Central Asia department at the International Monetary Fund. At a recent talk on the economic outlook for the Middle East, North Africa, Afghanistan, and Pakistan (MENAP) region, Azour argued that global economic headwinds were making policy efforts more urgent and challenging for MENAP. For oil importers in this region, growth is expected to ease to 3.6 per cent this, from 4.2pc in 2018, in part due to weaker global economic environment. These budget pressures underscored the urgency of lifting medium-term growth with structural reforms such as measures to improve business environment and governance, enhance labour market flexibility, and strengthen market competition, the IMF argued. While advanced economies were responsible for most global debt, in the last 10 years emerging markets have been responsible for most of the increase with China alone having contributed 43pc to the rise in total global debt since 2007. Turki Al-Sheikh, head of the Saudi Entertainment Authority and Chairman of the Arab Football Federation, announced that the 2020 Arab Club Champions Cup will be named the King Mohammed VI Champions Cup. “I am honored as the President of the Arab Football Federation that the second edition of the Arab Champions Cup will bear a name dear to all the Arabs, His Majesty King Mohammed VI, may God protect him, who honored us with his approval,” said Turki Al-Sheikh in a posting published Tuesday on his official Facebook page. 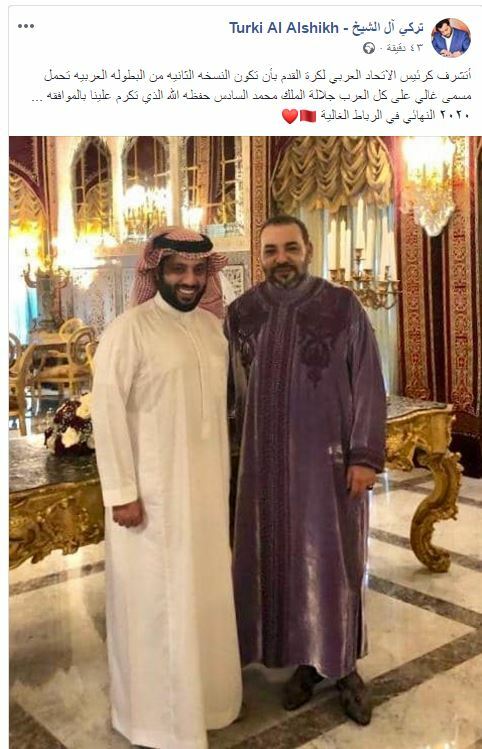 Shortly after arrival in Rabat, he was received by King Mohammed VI as shown in photos published by some local news outlets, including Barlamane.com. The 2018-2019 edition of the Arab competition bears the name of Sheikh Zayed Al Nahyan, to mark the 100th birthday of the late President of the United Arab Emirates. The Arab World’s inter-club football tournament, organized by UAFA, was formerly called Arab Club Championship before being renamed the Arab Club Champions Cup. Mike Cerre:Spikes in precipitation, both too much and too little, which are commonly associated with changing climate conditions, can be directly correlated with spikes in migration. 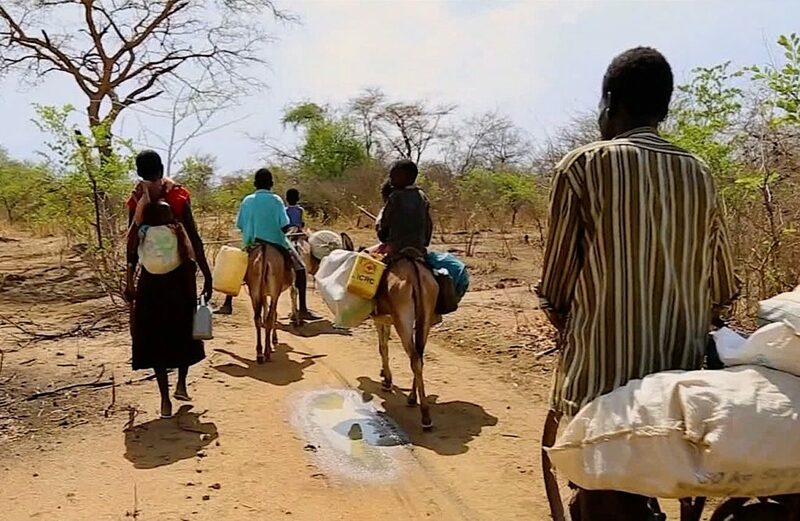 Combine that with the Sahel's dependence on agriculture and its chronic problems with poverty, population growth and lack of any real infrastructure for dealing with these issues, more people who depend on the land to live have no other choice than to leave. Thierno Diallo and his family had always been farmers, until the changing climate forced him to leave. Like other young men unable to support themselves or their families, he was willing to risk the treacherous desert crossing to North Africa, and across the Mediterranean in search of work, now that agriculture was no longer an option. Arab North Africa is in turmoil, and Americans are too tired, disillusioned or self-absorbed to do anything about it. The Arab Spring that swept the region beginning in late 2010 quickly turned into a long winter. Now Arab Spring 2.0 is upon us. 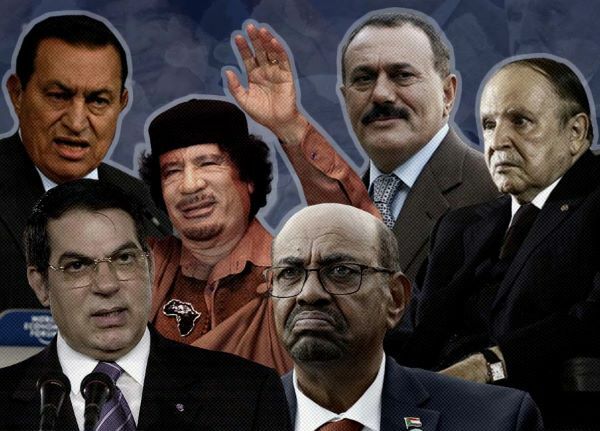 Last week, Haftar brazenly dismissed international pleas, including from the United Nations, to forgo a planned attack on Tripoli. Time and again, grim Arab realities have slapped advocates of democracy and good governance in the face. This is a summary of 17 AMN articles on the following subjects: Aleppo, Syria, Kurds, Turkey, Israel, New_Zealand, Iraq, ISIS, Russia, Libya, Tripoli, Saddam, Lebanon, Iskander, Masyaf, US. Categories covered in this brief: Syria, Turkey, Iraq, North-Africa, World-News, Lebanon, MiddleeastLet us know how you like this brief in the comments below. 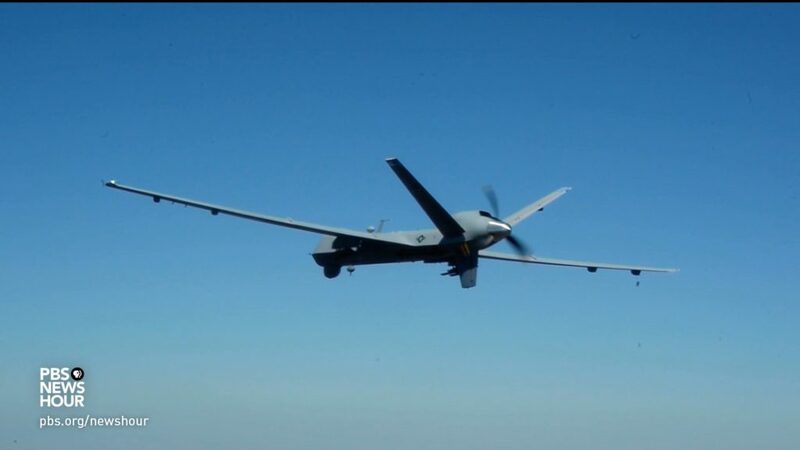 This attack by the Turkish Army on the YPG forces came shortly after their Air Force conducted reconnaissance flights over the Aleppo Governorate. While the Syrian military frequently tracks Israeli warplanes along the Syrian-Lebanese border, they have refrained from attempting to down any enemy aircraft because such a move would trigger a powerful response the IAF. However, as the Syrian military has seen time-after-time, if they remain idle, Israel uses Lebanon to enter Syria and then bomb their installations. Turkey exported $300 million and $825 million worth of jewelry in March and in the first quarter of the year, respectively, the Jewelry Exporters' Association announced yesterday. The highest jewelry exports, totaling $119.8 million, were made to Near and Mideast Asian countries last month, followed by the EU at $50.2 million, Asia at $41.9 million, North America at $31.4 million and North Africa at $25.5 million. 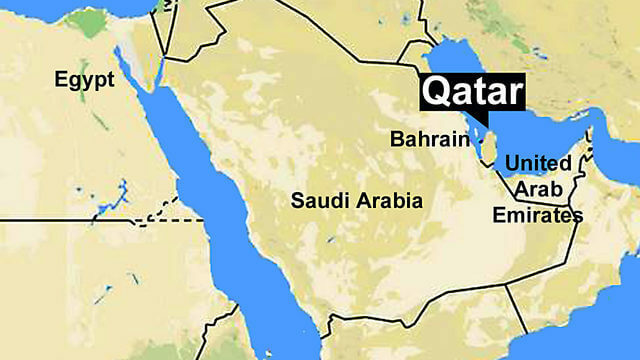 Jewelry exports totaling $83.7 were made to the United Arab Emirates (UAE) last month, with a 131 percent upsurge, followed by the U.S. at $29.7 million with a 20 percent rise, Hong Kong at $26.1 million with a 34 percent rise, Libya at $20.2 million with a 100 percent rise, Israel at $14.6 million, Germany at $10.8 million and Iraq at $9.6 million. On a quarterly basis, jewelry exports amounted to $825 million in the first three months of the year. Underlining that the jewelry industry is a strategic industry and must be declared so, Jewelry Exporters' Association Chairman Mustafa Kamar recalled that the association carried out $4.4 billion worth of exports in 2018. Download the full report: https://www.reportbuyer.com/product/5763696/?utm_source=PRN5G Technology Report DescriptionThis research report provides a detailed analysis of the 5G technology market and offers insights about the various factors driving the popularity of 5G technology. The 5G technology market report includes an extensive analysis of the key industry drivers, challenges, market trends and market structure. The global 5G technology market report starts with an overview of the 5G technology market in terms of value. The next section of the global 5G technology market report covers a detailed analysis of the 5G technology market across various countries in the region. It provides an outlook for the 5G technology market for 2018–2028, and sets the forecast within the context of the 5G technology market. However, inflation is almost 15% and the fiscal deficit is stuck in high single digits in relation to gross domestic product. Banks have been directed to earmark one-fifth of loans over time to small and midsize business to support that sector. The currency is firm at around 17.5/dollar, and the central bank recently cut interest rates 100 basis points. The loan/deposit ratio is low and local currency deposits are three-quarters of the total. Retail and Islamic lending are promising lines to match trends in neighboring countries, with the youth demographic inviting consumer credit. PepsiCo Inc. (NYSE: PEP) is set to announce its Q1 2019 results on April 17, 2019, followed by a conference call with analysts. The company is expected to report revenues of $12.7 billion in Q1 2019, marking a growth of 1.3% on a year-on-year basis. Revenue growth is likely to be driven by increased sales across all its operating segments, especially with higher growth in emerging markets. We have summarized our key expectations from the announcement in our interactive dashboard – How is PepsiCo expected to fare in Q1 2019 and what is the full year outlook? Lower ProfitabilityWe expect net income margin to decline to 10% in Q1 2019, which is a sharp drop from 35.1% in Q4 2018 and slightly lower than 10.7% in Q1 2018. Deep in the Sahara desert, ancient rock paintings depict a verdant world full of elephants, cattle, giraffe, hippos, and antelope. It was the most recent African Humid Period, or Green Sahara. The study also found evidence of a 1,000-year pause in the Green Sahara conditions 8,000 years ago, during a time when people abandoned permanent settlements in the area. So the Green Sahara returns about every 20,000 years, unless other climatic patterns, like large-scale glaciation, intervene. 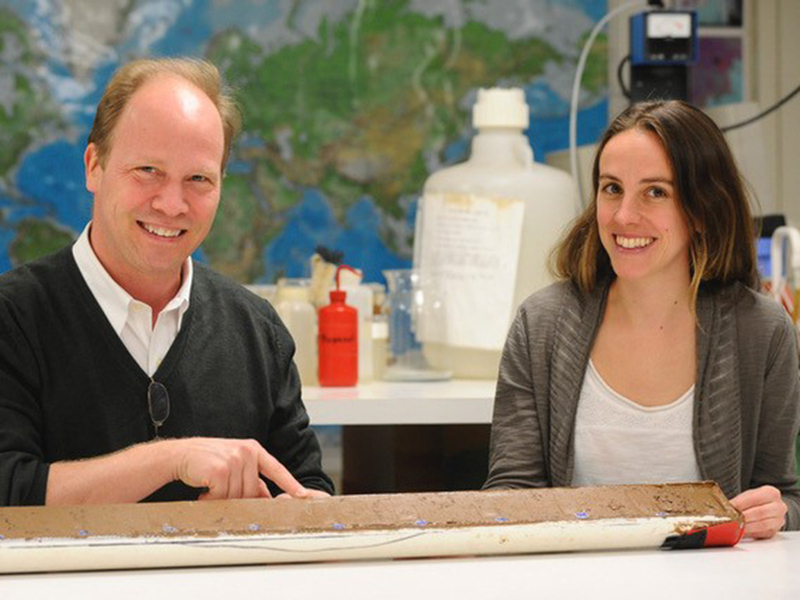 Tierney is interested in how past climate changes, like the Green Sahara, may have motivated human migrations. Economy Domestic air fares rocket in full Easter bookingsPlanes at JKIA. Silverstone Airline, which operates from Wilson Airport, is fully booked on April 18 and 19 for Mombasa and Kisumu routes. These fares are based on yesterday’s bookings and they are expected to continue rising closer to the celebrations. The rising air fares triggered the rush for the SGR tickets to Mombasa, which goes for Sh3,000 on First Class and Sh1,000 on Economy coaches. Air fares to Eldoret from Nairobi have been relatively low as the route is still not as popular as Kisumu and Mombasa. Those who support revolutions believe that the “Arab Spring” will ultimately succeed after drawing lessons from the failures of past experiences. The term “Arab Spring,” coined by an overly-excited European press, was a reminder that revolutions are generally seen from a romantic prism that might turn blinding. The Arab uprisings were celebrated as a historical moment that would usher the MENA region into a democratic era. During the 2011 Arab Spring and its aftermath, protest movements failed to achieve their goals after a promising start, with the exception of Tunisia. It is clear that those who support revolutions believe that the “Arab Spring” will ultimately succeed after drawing lessons from the failures of past experiences. 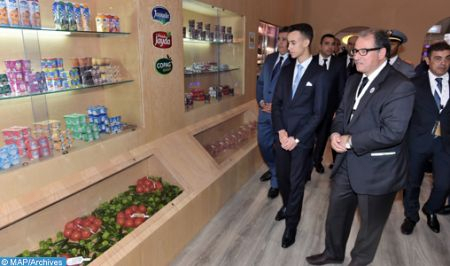 Morocco’s Crown Prince Moulay El Hassan chaired, on Tuesday in Meknes, the opening of the 14th edition of the International Agricultural Fair (SIAM 2019), held April 16 through 21 under the theme “Agriculture, an employment lever and the future of the rural world”. At the beginning of the ceremony, Crown Prince Moulay El Hassan handed distinctive signs of origin and quality to four farmers/producers from various regions of the country. Afterwards, the Crown Prince toured the fair pavilions and got informed on the products exhibited. He also stopped by the forum for youth entrepreneurship in rural areas held on the sidelines of the fair. Some 1,500 exhibitors from 60 countries are taking part in the fair. Kotoko's Gyamfi will consider a transfer after Zesco United speculationThe attacker responds to reports about a switch to the Zambian club after an impressive Caf Confederation Cup campaignattacker Emmanuel Gyamfi has responded to rumours about a reported move away from the club. Gyamfi's future has been discussed extensively in the media, with Zambian club Zesco United closely linked with the player. “I read online that Zesco are interested in me," Gyamfi told Graphic Sports. "Kotoko [say] they will consider negotiating with them [Zesco] to allow me to leave, but as I talk to you, no management member of the club [Kotoko] has informed me about any move. "I will never force a move away from the club because I need to have the club’s blessing when I’m leaving. The Union of Right-Wing Parties (URP) plans to ask Prime Minister Benjamin Netanyahu for the Diaspora Affairs Ministry, the party confirmed on Tuesday. On Monday night, Yisrael Beytenu leader Avigdor Liberman talked tough against haredi parties but did not specifically mention Shas pursuing the immigration portfolio. MK Oded Forer – a former Immigration and Absorption Ministry director-general – is Yisrael Beytenu’s candidate for the job, which the party plans to demand in coalition talks. In March, Shas leader Arye Deri said that the Immigration Absorption Ministry “will no longer be a ministry only for immigrants from the former Soviet Union (FSU). “Yisrael Beytenu will act against the humiliating DNA checks that haredi [ultra-Orthodox] political operatives invented,” Liberman said in March.